We’d love your help. Let us know what’s wrong with this preview of Get into Any College by Gen Tanabe. To ask other readers questions about Get into Any College, please sign up. This is 2016 edition. This one has new SAT standard. 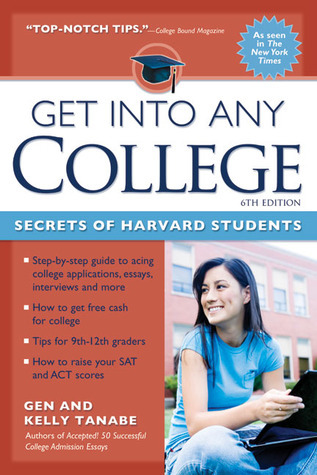 My summary: it is very comprehensive analysis about getting into college. I read quite a few this kind of book, I personal opinion with another 3 books, any parents could get solid image of college admission, and figure out how to help their kids. Rock Hard Apps: How To Write A Killer College Application by Katherine Cohen (3 examples, A+, A; A, A-; A-,B+ students, how to repackage to make outstanding. 1. p 7. What college consider in Deciding whom to admit. Personal Characteristic : Essay, Interview, Recommendation letters/evaluations. 2. p17 Steps to success, your admissions timeline. 9th - 12th grade. 3. p22 Apply between 8 - 12 schools, with 3 ranges, each 2-3 schools. 4. p249 College search worksheet; Evaluation / recommendation worksheet; College cost of attendance worksheet; Financial aid worksheet. 1. p 39 leadership does not mean you had to be an elected leader, but instead leading something yourself originally. 2. p 40. When to leave blank: white space is not aesthetically pleasing. If not enough activities, fill the space with description. But do not fill with meaningless information. 3. p42 Leave no questions unanswered: In the space that are not applicable to you, type a dash so that you know that you have not left the space blank by mistake. Chap 8 The secrets to crushing the interview. 1. The interviews is really not that important. 3. When enter the room, looks at the wall (decoration of room) for clue whom the interviewers are. 4. Usually the interviewers enjoy their college experience and like to give advice. 5. 2 ways conversation, be good listener and talker. 6. Note the interviewers' reactions to the topic, if appears uncomfortable, change the topic. 7. keep current events available as usually they are good conversation starters. 1. SAT math. Total 80 minutes into 55 min / 38 questions with a calculator, 25 min/20 questions w/o a calculator. 2 Type of questions, multiple choices, Student-produced Response or Grid-in. 2.1 reading section: 52 questions. multiple choices, 65 minutes. 2.2 writing and language section, 44 questions, multiple choices, 35 minutes. read 400-450 passages and improve them, non-fiction. optional, 50 minutes, read 650-750 passage, and write about it. 5. SAT subjects: 20 exams, five subject area. Score 800, one hour. Colleges required 3 exams. ACT :almost 3 hours, 4 subject areas. 1. The English test (75 questions, 45 minutes), grammar parts. 2. The math Test (60 questions, 60 minutes): preAlgebra(23%), Elementary Algebra (17%), Intermediate Algebra (15%), Coordinate Geometry (15%), Plane Geometry (23%), Trigonometry (7%), can use calculator. 3. The Reading Test (40 questions, 35 minutes): 4 college freshman-level reading passages. 5. Score 1-36, subscore 1-18, is all multiple choices. 1. The ACT contains the Science Reasoning Test which covers the use of data representation, research summaries and conflicting viewpoints in the natural science. The SAT does not. 2. About 7% of the ACT math questions are based on trigonometry. The Does not test trigonometry. 1. The test questions on the SAT get increasingly harder with each section. They do not on the ACT. In SAT Reading Section, the passages increase in difficulty, but the questions following the passages are in no particular order of difficulty. 2. The ACT is all multiple-choices. The SAT has "Student-produced response" math questions. 3. Both about 3 hours. ACT has 215 questions, SAT has 154 questions. 1. No penalty for wrong answers on SAT, ACT. 2. Score structure is different. I did not go over the score structure of ACT and SAT, since they are quite irrelevant to preparation of these tests, although detailed subscores are helpful to strengthen the weak points. 1. p 186 Memorize formula, although all the formula are given in the test booklet. 2. p187. There are no negative answers or answers greater than 9,999. Percentages must be filled in as .75 or 3/4, not 75. There tests make eligible for scholarship and special programs, such National Merit Scholarship or National Achievement Scholarship, Score high will be identify as Semifinalists. 1. PSAT: exam is October, definitely take in junior year, recommend PSAT 10 in sophomore year. 2. SAT or ACT: spring of junior year, or fall of senior year for second chance. For early admission, take exam in fall and spring of junior year. 3. SAT subject: take as soon as possible after you have completed the related courses. 4. AP tests: exam in May. Take as soon as possible after you have completed the related courses. This score may help you to earn college credit. 奖学金: based on academic or personal achievement, 一般叫 scholarship. 1. Grants or scholarships : no need pay back. 3. Loans: need pay back. 4. State Aid, e.g California's CalGrants, Georgia's Hope Scholarship. .need-based met by combination of grants, work-study or loans. .merit-based: award for skill, not related to student's financial need. .private scholarships can be need-based, merit-based or both. Federal Financial Aid: all based on financial need, except unsubsidized Stafford loans, PLUS loans, and Consolidation loans. .Federal Pell Grants: max to $5,775. no need to pay back. .Teacher Education Assistance for College and High Education Grants (TEACH grants). .Federal Direct Stafford Loans: through Direct Loan Program, Federal Family Education Loan (FFEL) program. subsidized (government pays the interest) vs. unsubsidized. Campus-based Programs : administered by the college financial aid offices. .Free Application for Federal Student Aid (FAFSA). Online at www.fafsa.ed.gov. Should be completed as soon of Oct 1, deadline is usually Feb 1, could be earlier if applying for early admission. After one month of submitting FAFSA, receive a SAR (Student Aid Report). .College Scholarship Service (CSS) Financial Aid PROFILE Service. Earliest deadline for register is Dec 15 at www.collegeboard.org. Deadline for submitting is Feb 1. financial aid outside federal government. 1. p211 Athletic scholarships are awarded for a maximum of one academic year and be renewed each year.